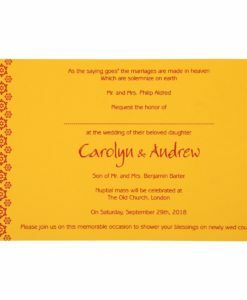 Rates of the wedding cards mentioned are per piece. 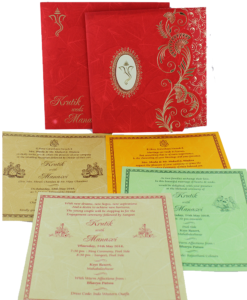 All wedding card rates include 1 wedding card and 2 inserts & 1 Envelope. Any extra insert will have to be bought at any additional cost. If there are more inserts shown in the photograph, it is for the colour options from which a customer can choose any 2 or 3 colours according to their Functions. 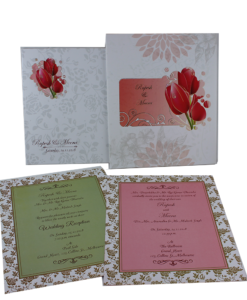 Minimum order quantity of any wedding card design is 100 pieces. Further, quantities should be in multiple of 50. So, you can order 100, 150, 200, 250 and so on Printing costs are extra as applicable. 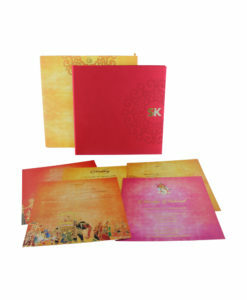 For making a customized card, minimum quantity should be 50 pieces. Quotation for the same will be provided via email based on your requirements. 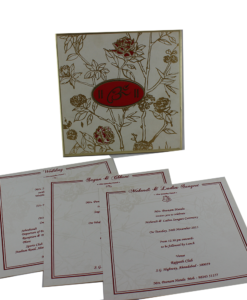 You can also order wedding cards without content printing also if you want. 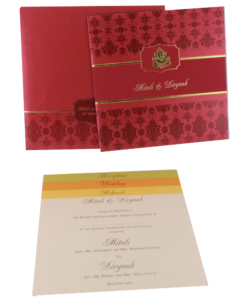 If the printing of text matter is required, then there can be a wastage while printing and processing of the cards. Generally the wastage falls between 3-5%, so the total quantity which is why delivered may have few lesser pieces. Slight variation in color must be accepted. The cost for RSVP card, Thank You card, or any extra add-ons will be extra. 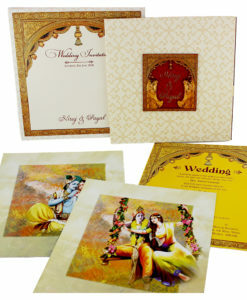 As to maintain originality, there will be pressline of VIVAH CARDS or our logo at the back of Envelope or cards’s holder. For completing order, 10 to 15 business days time is required (In cases of specially designed cards as per your requirement, it may require 10 to 15 days. No order can be cancelled once the process starts. Vivah Cards will not refund any amount on cancellation of orders in such cases.